Home » Blog » The decay of guest blogging is real – and why Matt Cutts was right all along! The decay of guest blogging is real – and why Matt Cutts was right all along! I’ll admit that this is not a post that I thought I would write. It’s a shame when we have something that is designed for good intentions and then it becomes corrupted for the sake of money. I’m referring to the decay of guest blogging. Cash Rules Everything Around Me; CREAM, get the money, dollar, dollar bills y’all! In the last week, I have actually reached out to up to 10 sites for genuine guest blog opportunities on their website. On their site, they would ask to write an application to contribute as an author on their site. However, a few email conversations later, I’d get hit with the line. I’m going to refer back to Google’s Terms of Service where they say that you shouldn’t engage in any link schemes, ESPECIALLY paid link schemes. And if the link is paid for, that the rel=nofollow attribute should be added to prevent PageRank from being passed from one site to another. Now I get that people want to make their money online and improve the quality of their own lives. But we shouldn’t be doing it at the sake of corrupting something good. A genuine promotional tactic is turning to spam (I was going to use another word, but it wouldn’t be ‘proper’ of me.) Google has made algorithmic improvements to combat this, but there are actually teams that review sites link patterns to see whether they are manipulating Google’s search results. And the thing is, the guest posts that are usually published aren’t difficult to spot. 1 single link from one single site that links back to their website. The link will contain keyword rich anchor text. The length of the post is usually around 500 words. A large percentage of the links pointing back to the site are from guest posts. Those sites typically have a lot of other outbound links from similar guest posts. The decay of guest blogging creates more appeal for black hat SEO. 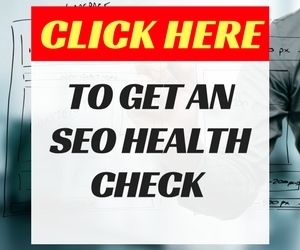 Economically speaking, it will be more cost-effective to set up a black hat SEO campaign than doing a white hat (grey hat or whatever you might call it) SEO campaign because people that want to do SEO will be getting priced out of the market. In one of my other case studies, I talked about how one campaign that I was involved in back in 2014 needed 140 links to get onto the first page of Google. 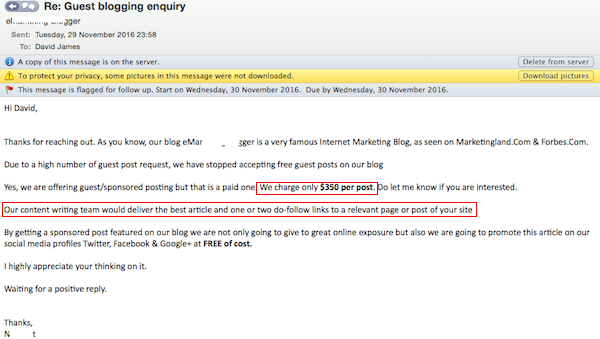 If these links were to cost $200 each, then a webmaster would have to publish $28,000 minimum as a fee to web publishers. You cannot say that you are doing white hat SEO and paying $28,000 in link fees to publishers to manipulate Google’s organic search results. If these links were to cost $200 each, then a webmaster would have to publish $28,000 minimum as a fee to web publishers. You cannot say that you are doing white hat SEO and paying $28,000 in link fees to publishers to manipulate Google’s organic search results. Additionally, there are several black hat SEO services that offer much cheaper alternatives that will expose your site to similar (or even in some cases, lower risk), while still getting your site to rank on the first page of Google. Whether it is through tiered link building using web 2.0s or leveraging Private Blog Networks that they have built themselves or using another network in the industry. Or even using article spinning tools to get the same effect as mass guest blog posting for a fraction of the cost. And the web master might only pay a few hundred or thousand dollars to get things up and running and monetise it until it stops ranking. Let’s go back to when Google first came on the scene. Back in the late 1990’s, the main way people shared content was through email, major websites, blogs, instant messaging chat programs and web forums. Links that were featured on blogs were published because they provided value to their audience. And it still occurs on genuine blogs today, but the race for links has corrupted this once noble practice. One of the reasons why guest blogging turns into a spammy activity is because people aren’t patient with delivering value first. In my videos and in my web content, you will continually see me say that it is important to demonstrate and publish valuable content on your platform so you can create opportunities to feature on publications as a guest blogger or contributor. People that recognise the value you offer will share your website’s content and earn your site links. But it needs to be done like a brand-building exercise where you continually build value over time. 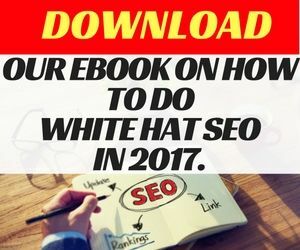 If you say that you want to implement a white-hat SEO campaign, but then you start the race for links, then eventually you will fall into black hat SEO practices. You can watch me talk about it in the video below. Google’s representatives continue to promote the same message over and over again. Focus on delivering valuable content first. Then create an opportunity for the content to be linked to naturally. This is incredibly true with guest blogging. What are some things that you should consider when it comes to guest blogging? Firstly, don’t have the approach “I will get as many links as possible from as many sites as possible.” Over the long-term, it is likely to be a recipe for disaster if you are planning to successfully implement a white-hat SEO campaign. Secondly, demonstrate value on your own site and with your own personal brand so that you can create guest publishing opportunities. Thirdly, reach out to influential websites in your industry that emphasise the value of information to their audience, rather than the value of the almighty dollar in an exchange for links. Guest blogging is an effective strategy when done well. 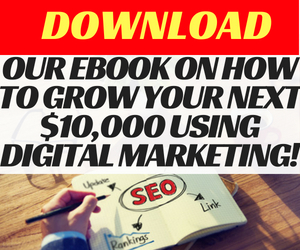 But it would be ideal if you don’t get caught up in the race for links that will force you to engage in activities that will see you shell out several hundred or thousands of dollars to get featured on a website. Where do you stand? Share your thoughts in the comments below.